Ponce rallied past Academia in Liga Americas opener. Hakim Warrick (206-F/C-82, college: Syracuse) came up with 26 points and 7 rebounds to pace Leones. Ponce dominated from start to finish. The Puerto Rican powerhouse established a 37:25 halftime lead. They extended the gap at 20-point mark heading into the fourth quarter and never looked back en route to the win. Carlos Arroyo (188-PG-79, college: FIU, agency: Interperformances) and Victor Liz delivered 9 points each in the victory. John Hernandez (207-C-84) responded with 16 points and 15 rebounds for Academia. 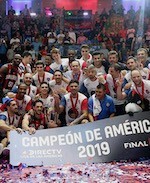 Weber Bahia secured the winning start to their Liga Americas campaign. They topped Cocodrilos in Group D opener. Juan Pablo Vaulet (198-SF-96) scored 18 points and grabbed 8 rebounds to lead the winners. Weber Bahia jumped to a 27:19 lead after ten minutes. Cocodrilos cut the distance at 3-point mark heading into the second half. But Weber Bahia sank 40 points in the second part of the clash and got away with a valuable victory. Anthony Laveal Johnson (203-C-88, college: Fairfield) and Lucio Redivo (183-G-94) delivered 14 points each in the win. John Flowers (200-F-89, college: W.Virginia) responded with 25 points for Cocodrilos. Maurice Sutton (211-C-89, college: Villanova) had 22 points in the defeat.